You can show your St. Patrick’s Day spirit by drinking an ice-cold mug of green beer. 1. Choose a light colored beer. 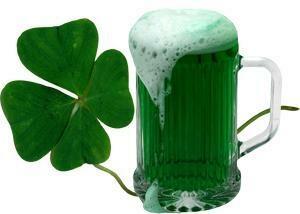 You can make darker beer green, but it requires so much food coloring that your teeth will turn green. 2. Squirt 4 – 6 drops of green food coloring in the bottom of a beer glass. Use more drops for beer of a darker hue. Use liquid food coloring, as opposed to gel; it’ll mix with the beer much more easily.Don’t use blue food coloring. You may think it will mix with yellow beer to make green, but since the colors aren’t pure pigments, you’ll end up with something closer to turquoise.